Sing, Spell, Read, and Write from Pearson Learning teaches young students (PreK-Grade 1) basic literacy skills through multi-sensory, sequenced steps that use songs, interactive charts, games, readers, and workbooks. Sing, Spell, Read, and Write Pre-Kindergarten covers colors, shapes, visual discrimination, matching, opposites, classification, story sequence, coloring, tracing, letter recognition, letter sounds, auditory discrimination, counting 1-10, zero, seasons, and oral vocabulary development. The teacher's manual provides step-by-step directions, enrichment activities, song lyrics, and a recommended read-aloud book list. Lessons include activity numbers to easily locate the correct activity sheet; objectives, recommended books, and lesson instructions are all included on the same page for easily found, coordinated planning. This set of extra preschool activity sheets is perfect for parents who have multiple children using the sold-separately Sing, Spell, Read, & Write Preschool Home Study Kit. The colorful, double-sided loose-leaf activity sheets include the "Join the Dots.What is it?," "Point, Say and Find," "Shapes," "Visual Discrimination," and "Opposites" pages, with parent/teacher instructions provided on each page. More than 100 activity sheets included. This multi-sensory, sequenced curriculum uses fun songs, interactive charts, games, readers, and workbooks to teach homeschooled students how to spell, read, and write. Covering two years' worth of language arts instruction, thirty-six steps divided between Kindergarten (15 steps) and Grade 1 (21 steps) cover the alphabetic principle, phonics, sound/letter correspondence, short vowel sounds, blending, and eventually how to read single and short-vowel words. Younger students begin with the Grade K workbooks, All Aboard and On Track, which feature larger print and fewer exercises. Six "Phonetic Storybook" kindergarten readers are filled with fun illustrations that will hold students' attention as they read the simple sentences that reinforce the lessons. 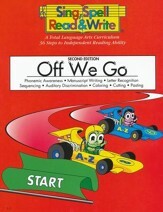 Grade 1 students will use the Off We Go workbook, which includes follow-the-dots, coloring pages, and tracing exercises that teach letter recognition, sequencing, auditory discrimination, cutting & pasting, and phonemic awareness. 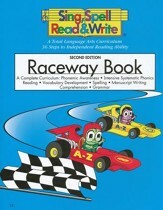 The second Grade 1 book, Raceway, has fill-in-the-blank, matching, and writing exercises to help children develop their understanding of systematic phonics, vocabulary, spelling, manuscript writing, comprehension, and grammar. The seventeen Level 1 Readers provide the practice and confidence-building students need to become fluent, independent readers. 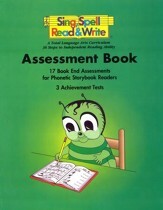 The Assessment Book includes 17 book-end assessments for the Phonetic Storybook Readers and 3 achievement tests that assess your students' word comprehension, word recognition, and story & sentence comprehension. Teacher instructions are provided for kindergarten in the K Instructor's Directions for the K/Level 1 Combo Kit Pamphlet, which provides a 4-page overview of the program's Level K components. The Instructor's Manual for Level 1 is much more detailed, and includes goals, suggested pacing, materials needed (with page numbers), procedures with semi-scripted instructions, phonics songs and games, and a written spelling test. An answer key is also provided. 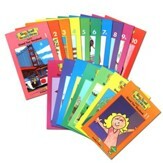 SSRW Kindergarten Level Readers 1-6, 2nd Edition, 8.25" x 5.25" each. 1 Instructional DVD: Edition 2, Level 1 for Home Study & Tutoring; 1 hr, 9 min. 1 Instructional VHS Video: Edition 2, Level 1 for Home Study & Tutoring; 1 hr, 9 min. A to Z Phonics Song Placemat 11" x 17.25"
Language Arts Raceway Placemat 11" x 17.25"
Kindergarten Instructor's Directions for the K/Level 1 Combo Kit Pamphlet, 4 pgs. 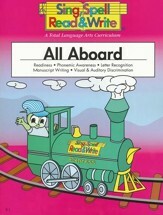 This book of assessments accompanies the sold-separately Sing, Spell, Read, and Write K/Level 1 Combo Kit with 17 book end assessments for the Phonetic Storybook Readers and 3 achievement tests. Test your students' word comprehension, phonetic analysis, story & sentence comprehension. Non-reproducible. Softcover. Part of Sing, Spell, Read & Write's Level K/1 Combo Kit curriculum, this On Track workbook can be used to extend your curriculum set through multiple children! Storybooks, matching, tracing, drawing, fill-in-the-blank, and other exercises will help children develop systematic phonics, vocabulary, reading, and comprehension skills; this book is designed to be used with the program. 144 pages, softcover with erasable-marker alphabet "slate" on the backcover. Part of Sing, Spell, Read & Write's K-1 curriculum, coloring, cut-and-paste, tracing, and circling exercises will help children develop phonemic awareness, letter recognition, manuscript writing, visual & auditory discrimination, and other readiness skills. Ages 4-8. 222 pages, softcover with erasable-marker alphabet "slate" on the backcover. Part of Sing, Spell, Read & Write's Level K/1 Combo Kit curriculum, this set of six Phonetic Storybook Readers can be used to complete your curriculum set if you don't possess the readers in the kit. Designed for students in kindergarten, fun illustrations will hold their attention as they read the simple sentences that reinforce the lessons. Books measure 8.25" x 5.25" each. 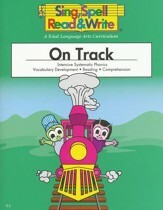 Part of Sing, Spell, Read & Write's Level 1 curriculum, this 2nd Edition Raceway workbook can be used to extend your curriculum set through multiple children! Storybooks, fill-in-the-blank, matching, and specific writing exercises will help children develop their phonemic awareness, systematic phonics, reading vocabulary, spelling, manuscript writing, comprehension, and grammar; this book is designed to be used with the program. 192 pages, softcover with erasable-marker alphabet "slate" on the backcover. Sing Spell Read and Write's Off We Go, 2nd Edition workbook is perfect for additional students using the Level 1 Sing Spell Read and Write kit. Follow-the-dots, coloring pages, and tracing accompany the curriculum's lessons. 112 pages, softcover. 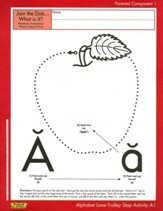 This set of phonetic readers is part of the Sing, Spell, Read, and Write Level 1 curriculum. Perfect for those who need replacements, or who bought the individual curriculum components. 17 readers (no. 1-17), softcover. 32+ pages. This set includes only the audio CDs from the Sing, Spell, Read, and Write Level 1 Kit. 17 tracks are included, including some music-only versions, as well as the songs with lyrics. 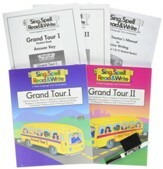 The SSRW Grand Tour II Kit includes two student workbooks (Grand Tour I & II) two answer key books, cursive handwriting teacher's manual, dry erase marker, and an eraser. As this course is designed to be a continuation of Level 1 (and the completion of the 36 steps of SSRW Level 1 is a prerequisite), if you have never purchased the above Sing, Spell, Read, and Write Level 1 Kit, you will need to purchase the sold-separately SSRW Level 1 Audio CDs. If you have the Level 1 kit, you will also have the required five games for this course, which are not sold-separately. The main part of this course is the "Language Arts Component," which teaches spelling, phonics, grammar, manuscript and cursive handwriting, process writing, and reference skills. These skills are taught in the required SSRW Language Arts Teacher's Manual (not included in the kit), which also provides directions for the Grand Tour I and Grand Tour II Student Books that are in the kit. The second part of the Level 2 course is the separate "reading component." The assessment tests are designed to be taken after the completion of Storybooks 4, 8, 12, and 17. If students have completed the Level 2 readers successfully, and parents wish to expand their child's reading skills, the SSRW Level 3 Storybook Readers (17 titles) are designed to be used with this Level 2 course. With challenging puzzles, word searches, decoding games, riddles, sing-alongs, and more, learning is so enjoyable for your second graders, they won't think of it as schoolwork! Building upon the Level 1 program, this comprehensive and multisensory curriculum integrates phonics, spelling, vocabulary development, reading comprehension, grammar, cursive writing, proofreading, and more. Includes two student workbooks (Grand Tour I & II) two answer key books, teacher's manual, dry erase marker, and eraser. 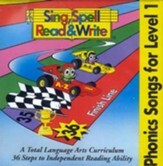 If you've never purchased Sing, Spell, Read, and Write Level 1, you'll also need the Sing, Spell, Read, and Write Level 1 Audio CDs and the Level 1 kit games in order to use this program. You will also need the Language Arts Teacher's Guide. Full-color student workbook pages include a wide variety of exercises arranged by "steps." Tracing, drawing, games, fill-in-the-blank, and other simple workbook-activities provide plenty of practice opportunities. The answer key booklets featured reduced-size student pages with the correct answers overlaid. The cursive writing pamphlet provides a few scripted sentences that instruct children on how to write each upper and lower-case letter. 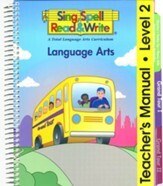 This Language Arts Teaching Manual is one of two teaching manuals for Sing, Spell, Read, and Write Level 2, and is designed to accompany the Sing, Spell, Read & Write Grand Tour Level 2 Kit. 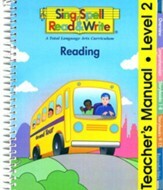 The sold-separately SSRW Teacher's Manual for Reading provides different instruction than this manual and provides the necessary accompaniment to the Grand Tour Storybooks. For an overview of the program, including both manuals, please see the"How does Sing, Spell, Read, & Write Level 2 Work" PDF. above. This SSRW Language Arts Teacher's Manual is necessary for the majority of the program. It provides directions for teaching the Spelling, Vocabulary, Grammar, Writing, Proofreading, Reference Skills, and Handwriting Lessons found in the Grand Tour I and Grand Tour II student books. In addition, classroom notes, schedules, chalkboard lessons, activities, biweekly process writing lessons, evaluation techniques, homework assignments, and reproducibles are also included. Color-coded "steps" will keep teachers on track, with overviews that list all necessary materials and lesson components (with page numbers), objectives, and detailed instructions on how to teach each lesson. Within each "step," lessons are organized by day, and then by subject (phonics, spelling, etc.). Process writing assessments and reproducibles are included in the back of the book. 485 pages, spiralbound, hard backcover, soft frontcover. Use reading as a means to solid learning. 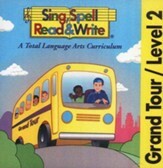 Sing, Spell, Read, and Write Level 2 is designed for students who have mastered the 36 steps of the Level 1 Program, and the curriculum centers around using 17 Grand Tour Storybook Readers to teach reading, writing, spelling, grammar, and comprehension. Students will build a powerful 1,440-word spelling vocabulary and learn to transition their handwriting from manuscript to cursive. In the Level 2 storybooks, children will be introduced to different states, cultures, and communities across the southern and eastern United States, providing an cross-curricular social studies connection. This teacher's guide provides not only individual lesson instruction, but also cultural appreciation activities, comprehension strategies, guided reading discussion questions, activities, internet ideas, and correlated reproducibles for the storybooks. Each storybook lesson includes the story on reduced student pages, story summary, setting notes, guided reading questions with page number cues, song notes for the sold-separately Music CDs, suggested pacing, additional reading and related activities, and recommended reading lists. Tabs separate sections between the overview of the course; comprehension strategies for primary concepts such as compare/contrast and main idea/story detail; lessons for storybooks 1-8; lessons for storybooks 9-17; and reproducibles. 333 pages, softcover, spiralbound. SSRW Level 2 Music CDs. SSRW Level 2 Grand Tour Assessment Booklets. This set of two music CDs is needed to fully use the Sing, Spell, Read & Write Grand Tour, Level 2, Language Arts curriculum. This CD includes the Grand Tour Narration as well as the Grand Tour songs for Level 2. 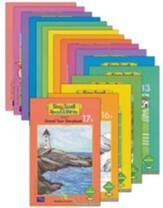 This set of level 2 readers accompanies the sold-separately Sing, Spell, Read & Write Grand Tour Level 2 Kit, and specifically, the independently-soldSSRW Level 2 Grand Tour Reading Teachers' Manual. 17 Storybooks; Level 2. Continue your child's Sing, Spell, Read, and Write Level 2 tour with this set of storybooks that brings your child to Mexico and Canada! 17 storybooks have two stories in each book; flip the book around for the second story. Each story focuses on a different state. These Level 3 books are designed to be used with Level 2 materials. 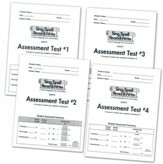 See what your little ones are retaining with this set of four assessment tests for the sold-separately Sing, Spell, Read, and Write Level 2.Designed to be taken after the completion of Storybooks 4, 8, 12, and 17, multiple-choice questions evaluate vocabulary, word usage, and comprehension. 6 pages each. Scoring chart on the front.